Just get that shot out eye look in place to flirt with your inner walking dead fan. In this episode we take rather simple approach to a look that has been made popular thanks to the epic zombie series The Walking Dead, as Carl Grimes happens to get a shot out eye. The effect itself is simple and can be achieved with many different methods. This one is pretty straight forward and doesn’t require too much supplies. It’s important to always be very careful when you create special effect makeups over, or close to, your eye. So be sure to take it easy and apply everything in a calm and controlled manor. 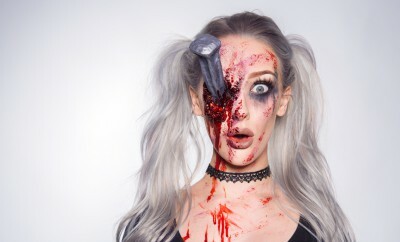 A shot out eye look like this is also perfect if you want to complete a zombie look or just look plain nasty at that costume party. If you want to take your shot out eye to the next level you might want to consider our fake eye tutorial. In that episode you’ll learn how to create a realistic looking fake eye that you can keep handy for those extra gory moments. Be sure to check it out! oooh! I LOVE the walking dead! really nice! I want to do this but as a pirate and have a lifted up eye patch. Where do you get the skin tape? Sculpting gel is really hard to find... the only one I can find is in the U.K. Is there any product like it in the US possibly on amazon or something? I'm thinking of doing this for a con. Is it safe to have the eye covered for an extended period of time? In twd carl lost his left eye? I'm loving this. Perfect for my Moira cosplay from American Horror Story!! I can't find the skin tape anywhere is there anything else that I can use? Could you use painters tape instead of skin tape? She_ Knives though...it might irritate your eye so be careful and make sure to have eye drops with you after you take it off! I assume this would work for a "eyes jabbed out" look too? What brand of sculpting gel do you use? Lucy Diamond it should be easy to use baby oil to get it off or even makeup remover. Hey, great work as always :) can I apply the liquid latex with flour directly on my skin(eye) or does it takes too long to drawn? EW THIS IS DISGUSTING O.O!! PERFECT FOR HALLOWEEN ! I LIKE IT ! For the black, red, and purple colors on the shot out eye, what product did you use? Do you buy your products or do you get sent them? I'm going as Asriel Dreemur but I might use some SFX makeup when I go to haunted houses. I love all your videos but always wondered what happens if you get itchy!?!?! What skin tape is used. I'm always afraid incase it pulls my lashes out!! ellimacs sfx makeup Random question, I am a total noob, how do you remove sculpting gel, or does it just come off? You could also coat your eyelashes with Vaseline beforehand so the skin tape doesn't adhere to them. Sounds awesome, but how he didn't fall over haha. Where can I buy sculpt gel? for halloween I'm gonna be a weeping angel like the ones in doctor who. I want to be the Tim Burton Cheshire cat for Halloween. I want o include zipper prosthetics into the look but I don't know how can you give me suggestions? can you do your version of a Texas chainsaw massacre look? For the painting (like at 6:40) are specific types of paint required or are simple things like water color or tempera paints okay? i love her lipstick....whats the color? ?